The mayor of London has revealed that he will not be ordering any further fleets of bendy buses. Ken Livingstone said they were only introduced for a small number of routes and there were no plans to put more on the roads. It follows a pledge from his Tory rival Boris Johnson who said he would scrap them in favour of Routemasters if he were elected as mayor. 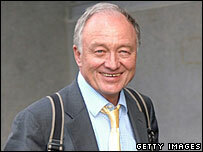 But Livingstone insisted bendy buses were popular with commuters. "They're very good buses," he said. "And although papers like the Daily Telegraph which ran a campaign against them may think they are deeply unpopular buses, when we ask bus users which buses they are satisfied with the bendy buses get slightly higher scores." Mr Livingstone added: "They were introduced just for a small number of routes. "We've got a few bus routes in London where there are just massive numbers of people using them and it overwhelms the older traditional double decker." Critics argue the buses are not suited to London's roads and have led to increased revenue losses for Transport for London (TfL) because they have no conductors. Introduced in 2001, they were temporarily taken out of service in 2005 when three buses caught fire.